Abingdon VA | Abingdon VA, Bristol VA, and Bristol TN Area Real Estate :: Highlands Realty, Inc.
Abingdon offers convenient travel to within approximately half of the U.S. population being located near three major Interstate corridors: I-81 (with 3 interchanges in town), I-77 (~50 miles north), and I-26 (~36 miles south). In addition, there are two local airports that provide air travel in and out of the region. 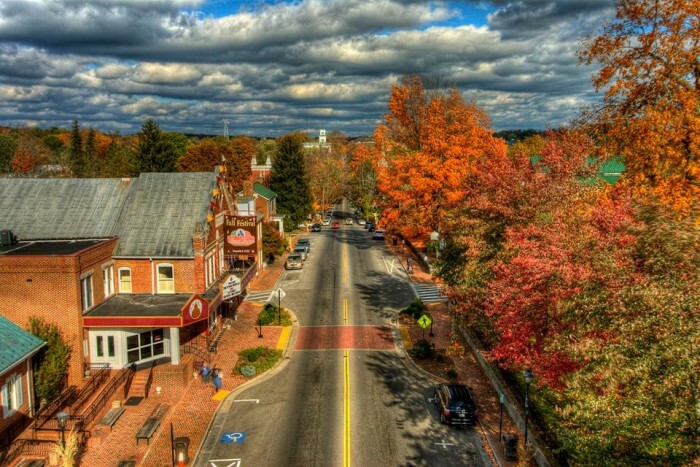 Located in the heart of the Blue Ridge Mountains, Abingdon offers varying types of areas to live including breathtaking historic downtown homes to large farms with rolling hills and amazing mountain views. Abingdon truly is a town for all! Southwest Virginia offers several housing style and location options from an in-town condo or traditional home to a farm house in the country. We have a team of professionals that will help you find the style and location that will fit your lifestyle. The median residential sale price for Washington County, VA is approximately $150,000. The lower housing cost and natural beauty of the region are why many choose to call Abingdon or the surrounding area home. The cost of living is ~12% less than the Virginia average and ~15% less than the national average. Community is strong in Abingdon and there’s no better place that shows this than the local community center. The Coomes Recreation Center in Abingdon offers a place for people of all ages can enjoy the benefits of physical fitness, exercise classes, leisure activities, and special event programs. The center presents something for all with an indoor and outdoor pools, basketball courts, tennis courts, volleyball courts, outdoor playground, dog park, walking trails, indoor walking track, and more. There is even an option for children ages 5-11 years old for an afterschool program. The community center is a great asset to the community by providing individuals with the space needed to stay healthier, happy, and meet others in the community. A popular annual event that takes place in Downtown Abingdon has become a tradition for many locals to attend or volunteer with is the Highlands Festival. The Virginia Highlands Festival is an annual celebration of the cultural heritage of Southwest Virginia area. This 10 day long festival is a summer event many local and visitors plan to attend each year. You will enjoy great music, unique items from local artisans, treasured antiques, and plenty of local foods! Many activities are planned during the festival for a variety of age groups; making it a family friendly event that will quickly become a family tradition. Abingdon offers eight public schools and one private school serving grades K-12. The area is also home to three continuing education facilities: Virginia Highlands Community College, Southwest Virginia Higher Education Center, and Emory & Henry College. Virginia Highlands Community College is conveniently located off Exit 14 and is also where the campus of the Higher Education Center is located, which provides classes and services for both students and adults wishing to expand their knowledge further. Emory & Henry is the oldest college in Southwest Virginia and is a 4-year institution with over 25 programs of study. Abingdon offers small town charm with access to modern conveniences and amenities. You’ll love the slower pace that is not found with the rush in larger cities. There are many opportunities to support small business with the variety of local shops and restaurants in Downtown. The generally friendly atmosphere will attract you to call Abingdon home.